A weekly newspaper produced a souvenir edition to thank the organisers of an airshow which brought 70,000 to its patch. 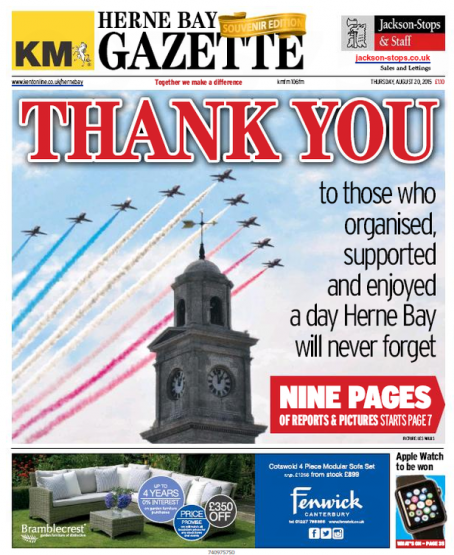 The Herne Bay Gazette carried 10 pages of coverage of the show, run by a team of volunteers. The KM Group-owned title also featured two pages of pictures sent in by readers, as well covering the event on the day on the company’s KentOnline website and kmfm radio station. The Gazette’s team covering the show also provided comprehensive coverage after a man collapsed by the town’s pier during the event. Editor Leo Whitlock said: “We all know that doom and gloom normally sells papers so it’s nice to splash on a positive story that we hope will see hundreds more papers fly out of the shops. The airshow was a precursor to Kent’s commemorations of the Hardest Day, the 24-hour period which saw the heaviest losses on both sides during the Battle of Britain. The Gazette carried a double-page spread paying tribute the RAF heroes who took to the skies above Kent to take on the German Luftwaffe. A) what exactly is comprehensive coverage of a man collapsing in the street? B) isn’t the idea of printing every minute detail of this incident really poor taste?